Picking up where we left off, the end of March and the beginning of April were a time of LOTS of good eats! Here's a few more tasty spots. I was practically kidnapped by a longtime friend who insisted we go eat at North up at the Domain. And while they are a small chain (only six locations nationwide), they do make all of their food in-house, including the pasta. Turned out to be a really great meal! 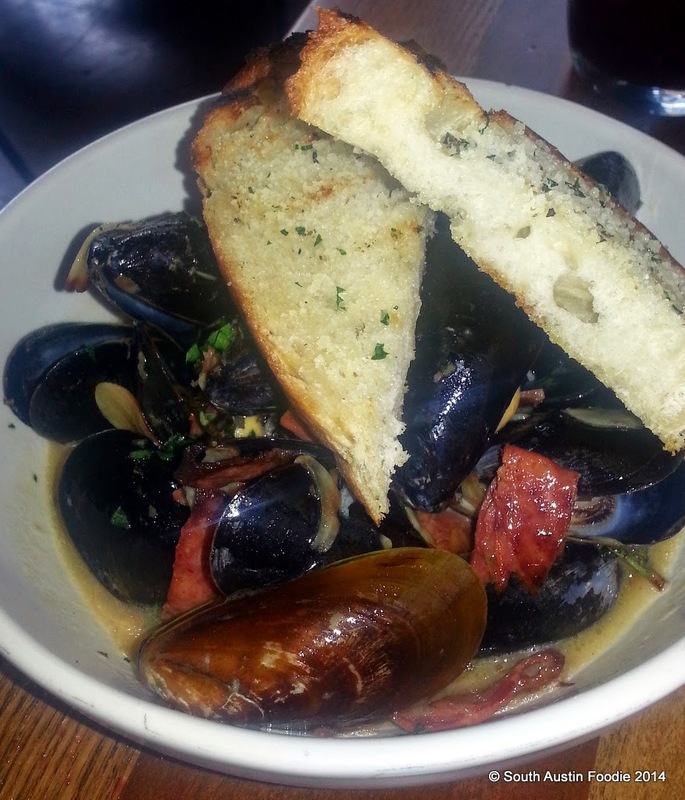 We started with the mussels, which have little bits of salami in the white wine and garlic broth; one of the best bowls of mussels I've had in a while. 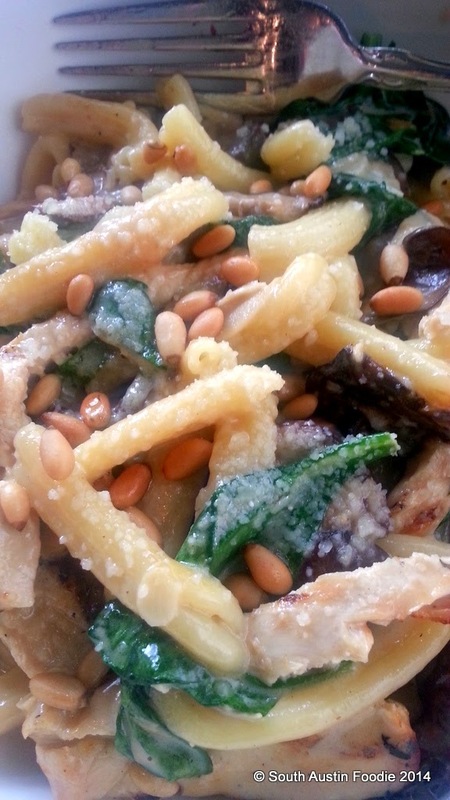 I had the strozzapreti, a hearty pasta dish with chicken, mushrooms, spinach, and pine nuts. Very filling, I happily took half of this home for leftovers. And dessert. 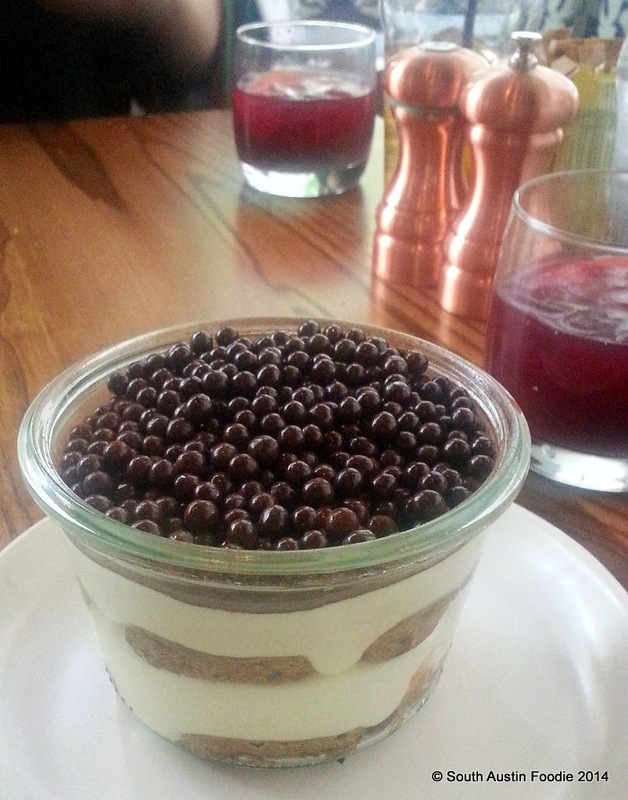 Their tiramisu had a nice touch with teeny little crispy chocolate caviar balls on the top; it could have had a bit more espresso flavor to it, but the balls and the glass bowl alone made up for it. I LOVE this glass bowl, and would love to purchase some...there were no markings on the bottom of it, and I've started searching online, to no avail. Probably a 10 - 12 ounce capacity, and 4 inches in diameter at the top. If you have suggestions on where to find, please let me know! Very pleasantly surprised by North. Our server was great, and at 2 o'clock on a Saturday, the place was packed. Also liked the creativeness in serving some of the dishes on wooden boards, which we saw at nearby tables. One of my blogger friends had commented on one of my recent pictures from Asia Cafe (a place I have been numerous times and really enjoy), and the conversation led to us making a date to go to Szechuan House on Burnet Road, a place she really likes and I have heard good things about. Five of us met for an early Sunday dinner, and after a lengthy time studying the menu, I think we ordered some great dishes! 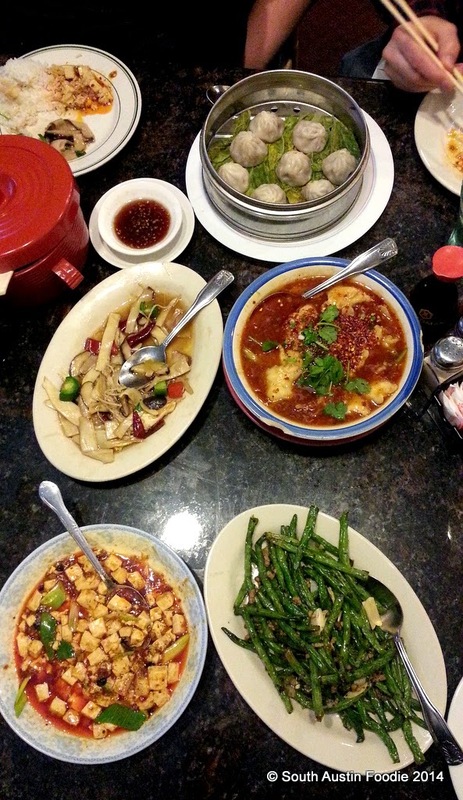 At the top of the picture, are the #A4 steamed dumpling with pork. They had a nice thin (but not too thin) dough around them with a multitude of tiny pleats! Beneath it is #F9 fish with fiery sauce; we all thought this dish was okay, but maybe not the best of our assortment. It was a bit more like fish stew, and while tasty, it wasn't extremely hot (as in spicy). A crispy/fried fish would have given the whole thing a bit more body and texture. The #V6 dry fried green beans were yummy! Now they did come with a little bit of ground meat on them (and its not mentioned on the menu), so if you're vegetarian, be sure to ask them to hold off. In the bottom left is #T1, ma po tofu with ground pork (I remember the server did ask us if we wanted meat with the tofu dish, but I don't think they asked us on the green beans.) This (and the fish dish) had some nice szechuan peppercorn flavor as well as being bathed in chili oil. If you haven't had them before (or maybe you have and didn't know what you were eating) the peppercorns produce a nice tingly, mildly numbing and tastebud-altering affect in your mouth. The #V7 was three kinds of mushrooms in a light brown sauce; the mushrooms had a really nice light smoky flavor and overall was a favorite dish. Not pictured is #P1, the twice cooked pork, which was thin strips of pork belly sauteed with green onions; very tasty, but I would love it a bit more cooked. You can bring your own alcoholic beverages with you, and that helps keep the total cost down. For five people, we paid $15 each and were stuffed. Based off this first visit, I'd say Szechuan House is pretty comparable to Asia Cafe. I like them both, a lot! Just wish we had one of these down south! Gianfranco started us off with a couple of the different pizzas, and gave us a personal demonstration of how they shape the dough and cook the pizzas. The four formaggi (four cheese) pizza is above, and here he is at the pizza oven discussing how they're made. 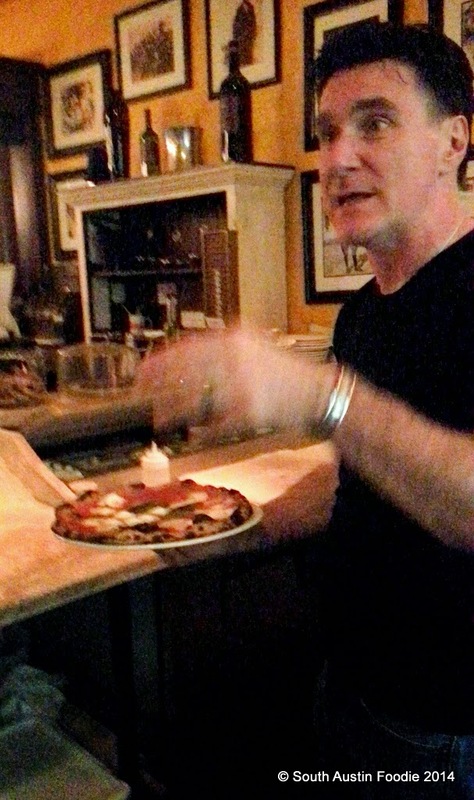 He was very animated and passionate about his pizza (as well he should! ), which cook for only a few minutes in a special wood-burning pizza oven that gets ridiculously hot; the pizza should have a crust that is a bit crisp, but still chewy and toothsome. 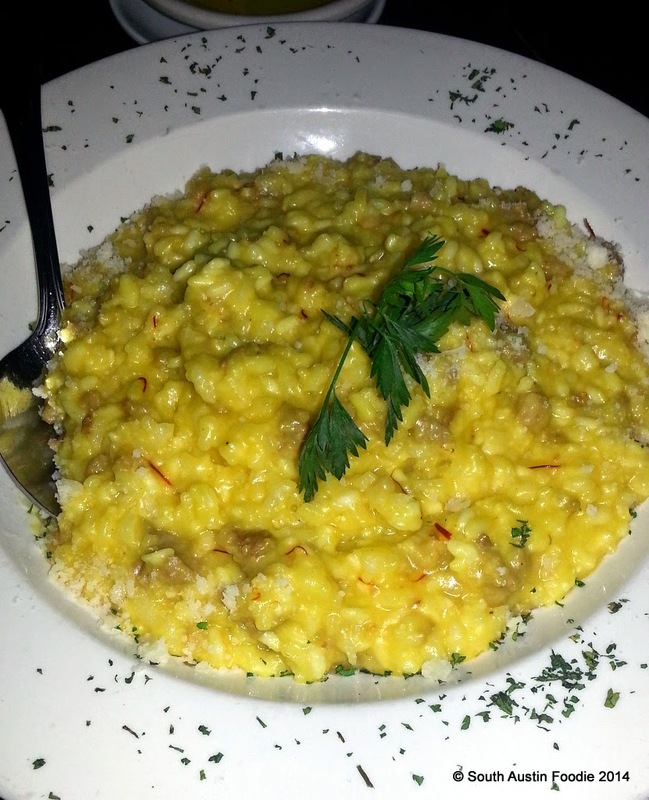 This is the saffron risotto, not my personal favorite because I am not a huge lover of saffron, but the color was gorgeous. 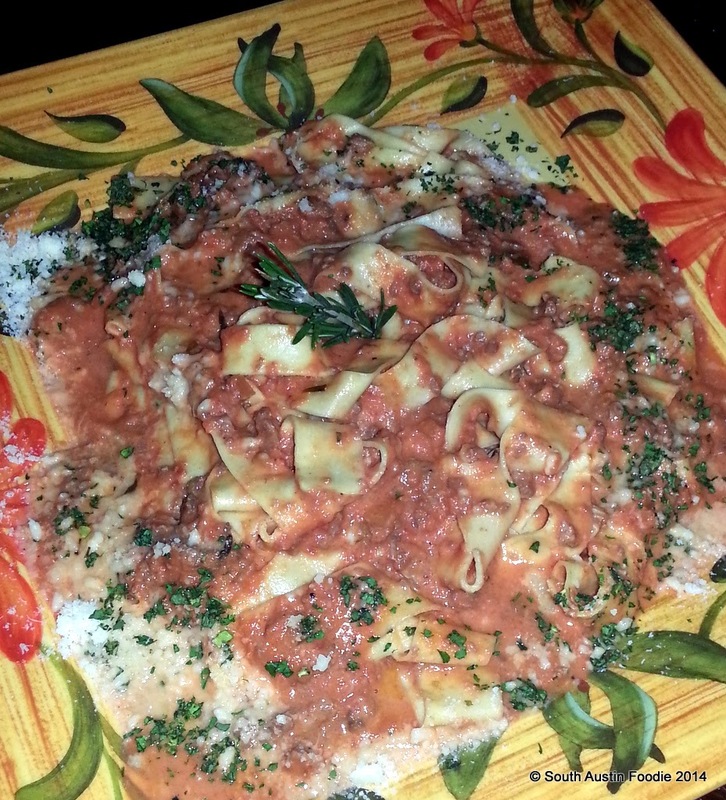 One of the evening specials was housemade papparadelle with rabbit ragu, and it was fantastic! I think we all agreed this was the best dish of the night. Supple ribbons of pasta with a sauce that had a lot of flavor, but was not heavy. And just when we though we were completely stuffed, they sent out five different desserts! 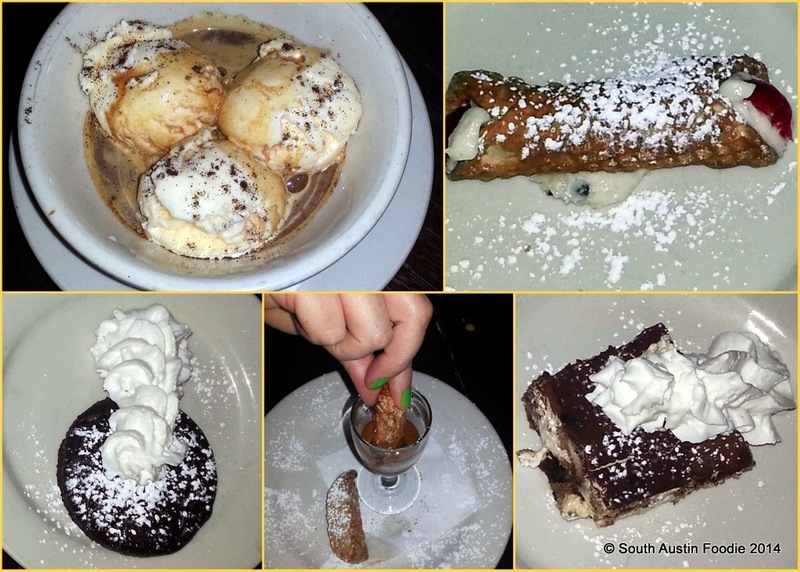 From top left: affogato, cannoli, tiramisu, biscotti with vin santo (sweet wine for dipping the biscotti), and a brownie/fudgy tarte decadent combination. And between eight of us, we finished them off pretty well! Thank you again to Gianfranco for welcoming us. I spied some items on the menu that I'd love to go back and try sometime, like carbonara, paninis and roasted sea bass. 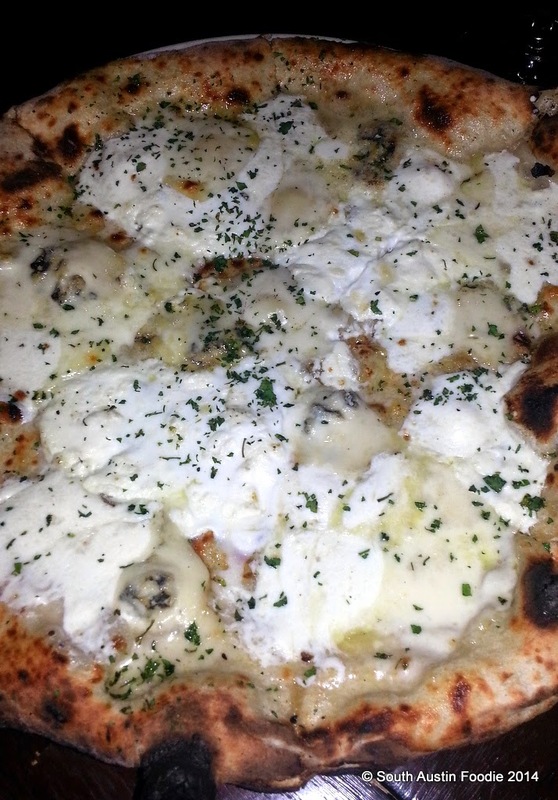 If you happen to find yourself downtown, go and check Quattro Gatti out! 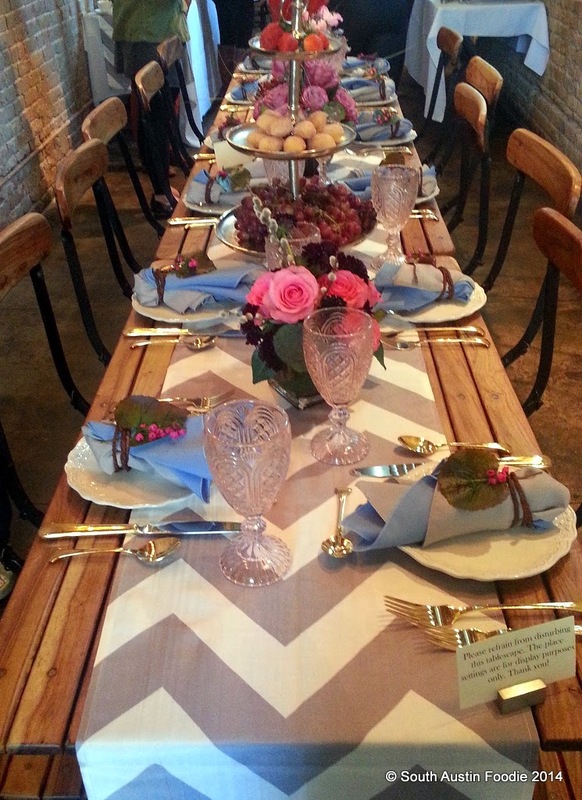 I was invited to an open house at Walton's Fancy and Staple on West 6th Street. If you're not familiar with them, they serve breakfast and lunch, and have a beautiful pastry case. 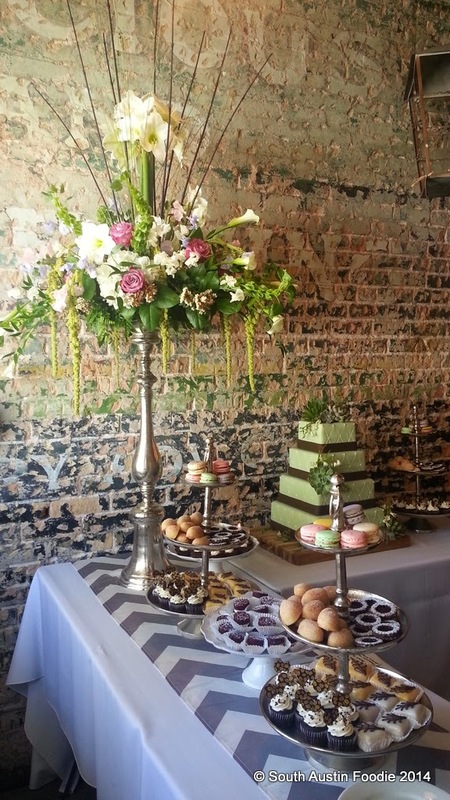 But they also do catering and floral arrangements, as they aim to be a one-stop shop for your party needs. I loved this tall floral piece, and they also had fun ones hanging throughout the room. Their "Hideaway" room was set up for the event; it seats up to 30 guests if you're looking for a place to hold an event. Their catering can of course also come to you! It's been good pickins! No complaints about any of these Austin eateries! This looks so deliciously great, especially that strozzapreti! This is definetely going on my "next to visit" list. Fun post! I'm pretty sure the glass bowl is the bottom portion of a weck jar (the name is often stamped on the top, which explains why you didn't see a brand name). You can buy them at Treehouse, in the south central market shopping center.